Amazingly having just got back from the Alpaca rally I launched into another one immediately! This one was the Paris to Vienna rally which started 14th June. For this one I drove my 1938 Alfa Romeo 6C SS Torpedino. this has an engine size of 2500cc and has 110bhp, 4 speed, no synchro on first or second gear. It did not get off to a good start for us, as the car failed on the M25 on the way down and we had to get the RAC out to help get it off the motorway. 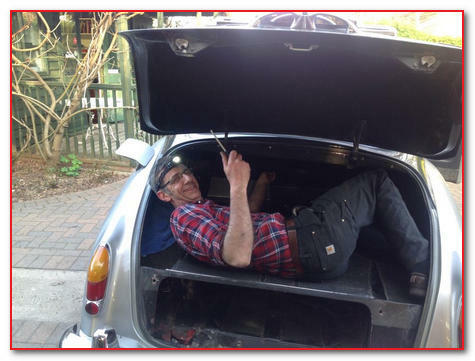 Luckily an old friend and classic car restorer and fellow rallyist Mark Tipping's workshop was not far away, so with his help and a new battery we got underway again. But we got in late and were definitely not on top of things. But the next day was another day, so things, including the weather did improve, we did arrive in sunshine having been in all kinds of weather on the way. Here we are in Mark's workshop, trying to fix the Alfa. Here's the car all ready to get underway again. It was a bad day most of the first day, as the battery charging problem reappeared. So we spent some miserable, rain-soaked time trying to fix the car, to no avail for the rest of that day. We missed most of the morning's rally, which takes the pressure off a bit as we were no longer in contention. Had a nice end to the day when, as a complete surprise, my friend Hayden's brother Brett was at our hotel and in my car! I had lent it to him to go sailing in Europe, with no idea where he was going. That's him with me and the Phev in the background, which we then used to charge the battery on the Alfa. We got off to a very damp start the next day, by the lake. Note the zero weather protection! This was at the Hôtel Beau Rivage Gérardmer. We had good roads following this and arrived in Austria to actual heat and blue skies. A remarkable change! All too soon, the rally was finished! Despite our battery problems we made the end in good shape and had a great time. We drove through some atrocious weather just when the car had started to play up really badly but the car and the weather both improved after that. The car made the journey back home by truck as the battery wasn't charging at all. 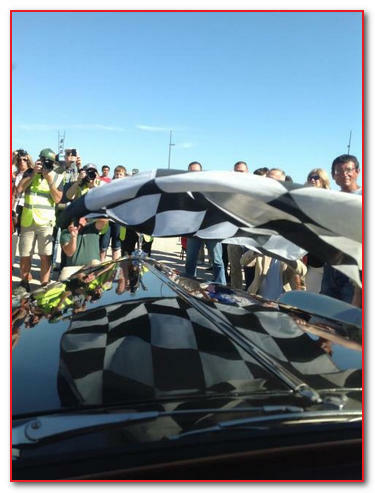 The following photos are courtesy of Fiona Easterby, showing the finish line, another competitor in an E-type and us travelling along in the Alfa. You can find out more about the Paris to Vienna rally on their website. This year's rally was inspired by the heroic pioneers of early motorsport, and was a regularity competition in the spirit of the original Paris-Vienna race of 1902, an epic, 559-mile (900km) contest that included a daunting crossing of the Austrian Alps. Here's a photo of the original competitors from 1902. There's also an article in The Telegraph about the original rally. This promised to be an intriguing event, travelling through the Amazon rainforest, driving on some of the most amazing raods in South America. A coast-to-coast drive from Suriname on the Atlantic coast all the way across to Lima in Peru on the Pacific coast, and on the way seeing French Guiana, Brazil, the mighty Amazon, Machu Picchu, Cusco and the Nasca Lines. I decided to take the Mercedes 280SL with me on this trip, and apart from some badly worn tyres, it lasted pretty well on this very challenging route! Here is the trusty 280SL outside the hotel in Paramaribo; And me, by the hotel pool drinking the local brew. In Parbo now, there are lots of lovely old run down wooden buildings in the town; Suriname was formerly Dutch Guiana so there is a heavy Dutch influence here and some beautiful wooden buildings. All the buses, have slogans all over them with these pictures of fit kids. Sadly most of the passengers do not look like this! After Parbo, we visited Parmaribo in Suriname. It has the world's biggest wooden cathedral. The houses are very ornate and beautiful, here's another from Parmaribo and also the Mercedes outside the president's house. On our first day we went from Paramaribo in Suriname to Kourou in French Guiana. Of course, no trip would be complete without a brush with the local police! They chased us for speeding but they picked on tail-end Charlie so we got away fine! We then had a fun wait for the ferry across yet another huge river, which forms the country's border. We had no problems to enter French Guiana, amazingly it is part of the EU. Their currency is the Euro, they have French cops, the lot, this must cost the EU a fortune! It's now where the French launch the Ariane satellite rockets. Here we are boarding the ferry on our way across to French Guiana. We left French Guiana, heading for another border and a ferry to Brazil. On the way we went to see the satellite launch site where the French send up their Ariane rockets and lots of smaller Russian ones. We had a lovely drive through the jungle to the Brazilian border, here we are waiting for the ferry in a small town on the bank of the Oiapoque River which forms the border, very hot and humid, no place for a white man at all! To Brazil now and another great day's driving with a long dirt section of road with lots of little wooden bridges, holes etc. We ended up bright orange "Tangoed" by the dust, as we caught and passed several vehicles in the dust. I had an embarrassing moment when confronted by a convoy of traffic coming off one of these one-way bridges after a blind brow. I had two options: one was to have a head-on with the lead car and the other was to take to the bushes. I chose the bushes! No harm done apart from my ego which will recover, and it gave Angus, a fellow rallyist, a triumph as he was able to winch us back up to the road. In Macapa now, about to board the ferry for our trip up the Amazon. We had very poor wi-fi in places so weren't always able to send photos, but we had a great few days sailing up the Amazon on the good ship Bruno going from Macapa to Santarem. It took 4 hours to load the boat, it was just like a movie set. There were no vehicles, cranes or mechanical devices, everything was manhandled on and off the boats, hundreds of people involved, complete ordered chaos, great fun. The cars were loaded on very slowly on wooden gang-planks across a big gap, then two hundred turns later lined up on the lower deck. We had two nights and a full day sailing with many passengers all sleeping and living in hammocks, we all bought hammocks as well and joined in though we did have tiny cabins with a/c and loos. Santarem to Itaituba was a good trip but I had a bit of a problem as my engine's sump sprang a leak towards the end of the day. I had to buy lots of oil to get to the hotel but found some good guys to help and soon fixed it by welding it up myself. Itaituba to Jacareacanga was the best drive yet, 370 km through the the jungle through the Amazon national park, wonderful red dirt road, tiny wooden bridges and for the last half, a wet road which made staying on the road very tricky and passing vehicles in either direction very exciting as the road was like ice as soon as you were out of the wheel tracks, just like the dry line in racing. My friends the Kanes had a bad day in their Mustang as it broke the rear axle casing and then the half shaft itself but with my supervision and fantastic help from the locals we got it mobile again overnight. Great effort and on a Sunday to boot! They had to drive very slowly to Porto Velho two nights away when an arriving navigator brought them new parts. Our next stop was Apui, more jungle, more dirt and dust. We were not a pretty sight and at the end of the day, tired and dirty but happy with the driving and the trip. Here we are on the boat trip up the Amazon, with a well-loaded pick-up leaving the port and another Amazon ferry like ours, waiting to depart. We had dinner on board the boat, it was absolutely delicious, although it was hard to say exactly what it was! And here is a fellow passenger having a watermelon dinner, there are lots of them everywhere and they are just delicious. If you've ever watched one of the "Top Gear" specials, this scenario might ring a bell or two for you! Here we are getting off the ferry, having crossed the Oiapoque River. Click the Play button on the video to watch. Here is the Mercedes on board Bruno, our transport up the Amazon for two nights and one day. We all bought hammocks and joined hammock culture! There were 3 classes of travel on the boat: middle deck, air con & hammock space; top deck, open hammock space; and then posh air con cabins, we all used the hammocks during the day. This is another typical wooden bridge. There are masses of vultures along the road all the way often with roadkill to clean up. Then we had a problem with the car - it had oil bleeding from the sump. It was an easy fix but was embarrassing on the ferries. And here I am at an informal petrol stop where it was dispensed in 2-litre bottles, all very efficient and reasonable price considering the alternative which was walking 600 Km with no gas station! Dead Mustang on the road behind the Mercedes, awaiting rescue. Their rear axle housing broke and then the half-shaft inside gave up as well so no drive. It was expertly fixed that night by local garage. Dead Mustang being revived on the hoist most of the night. Light aircraft using the road as a runway, lots of this going on and this particular one was very impressive as it must have been very heavy and it was very hot so it was below the trees for what seemed like forever before it eventually staggered into the sky. On the road next day and crossing on yet another River ferry. A rare sight of the 3 classics on the rally waiting for a ferry together. We'd had a day off the previous day, so the Mustang was further repaired and got a new non-welded half-shaft and was then fighting fit. The Lotus front suspension collapsed the day before when we had another long run on some atrocious badly maintained roads, but it was welded up and was ok as there weren't many dirt roads after that. Shame as I enjoy the challenge :). Ferries were barges with tugboats fastened by the bow on a swivel fitting like a tow hitch, strange but very effective. This one was named in homage to Senna. Very grubby Mercedes with hundreds of butterflies massacred on the front, there were huge amounts of them all along the road on the last jungle day, it was very tricky all day as there had been massive thunderstorms which by sheer luck we missed but this turned the road into a very slippery affair. We had a very busy few days after this, long runs in extreme heat and humidity leaving Brazil and crossing into Peru. The last day's drive in Brazil was a mixture of good and bad, several hundred kilometers of rough but good fun dirt road with rough bridges to cross, then really bad dirt roads with corrugations that shake the car to bits, followed by good tarmac with bad holes and some like bomb craters! Crossing into Peru took a while but it was all good humoured and a bit of a party. The Peru roads were a complete contrast, flat smooth tarmac all the time. We spent a good day off in Puerto Maldonado, took a dawn trip to see thousands of parrots feeding on special clay that occurs naturally on the river bank and then in the afternoon another trip to a guided jungle walk to a walkway of little wooden suspension bridges high up in the canopy. All in enormous heat and humidity, we all survived ok! I gave the rally doctor a ride, which he seemed to enjoy! Our next excursion was a trip to the aerial walkway, where we passed a stall selling piranha fish, which are huge and apparently quite delicious, or so I'm told. Here you can see us at the start of the walkway, in the canopy. And there is Allison, halfway across a very wobbly suspension bridge! We had an impromptu lunch at 15,000 feet, it was fish and boiled potatoes washed down by coca tea, very good. Also evidence of a slight wound on the Mercedes, caused by the Mustang! We met a very cheery pineapple sales lady - there are lots of fruit stalls around, delicious! Now we reach Peru and see a lovely lady waiting in her Sunday best to go to market in the family alloy shelled Tuk-Tuk. Marvellous old flame tree in a local park, with Sunday football going on in the background. The next part of our trip was to Machu Picchu. We got our first view arriving after a 2 hour train trip and then a very steep climb up the mountain on expertly driven tourist buses for half an hour, but it's well worth it when you get there. It was lovely weather when we were here, cool nights, hot but dry days, heaven after the steaming jungle! Here I am in a temple doorway showing off the very bitten legs, midges who don't believe in repellent at all! One of the original water sources that supplied endless water which allowed the city to be built where it is. Central courtyards where games, parties etc were held. Me with the astrological stone that they used to mark the passing of the seasons. We came across a cheeky local, looking for food and conversation! And these are reflecting pools, used for observing the stars. This is a marvellous condor carving, with wings behind it, matching rock and mountain carving. And here we are having another lunch, this time it's fish and chips while wearing a fur hat! We went condor watching one morning and saw some really close up. We'd had a great drive the day before on really tough dirt roads but good fun for me. We also saw pink flamingos on the salt lakes. The car is fine in general but is refusing to start at high altitude and in this heat. We went to just under 16,000 feet yesterday and again today, all fine as long as we don't stop! I spent last night taking out and repairing the water radiator as I realised the strike busting crossing the rock barrier had pushed the water radiator back onto the power steering pulley which had now made a hole in the radiator. It took a couple of hours work with Paul's help, we had it all done and then went off to dinner. After condor watching we went back to the hotel, then a leisurely drive down to Arequipa, only 7,735 feet so everybody was feeling friskier, especially Toby the support mechanic, who felt the altitude badly and has been using oxygen all the time and was still unwell. Click the Play button on the video to watch the condor. Little girl Peruvian girl with her mother on the Condor site stall; Mercedes and Lotus at rest; Potato types in a tiny museum; There are lots of roadside shrines to people killed on the road, some of them are very touching and well done. We had another long day driving 784 kilometers from Arequipa to Paracas, great roads with lots of traffic to keep me interested. We averaged 95 kph, so lots of fun. The next day was a day off to sort out the cars and get them ready to ship. Mine is going off to Panama to do the Maya Classic next February, this is a drive from Panama to Veracruz, Mexico. These photos show: a moody shot of the active volcano which overlooks Arequipa; Our first view of the Pacific Ocean, coast to coast in 21 days; We stopped to climb the viewing tower to see some Nasca lines; Big dunes and great views all the way along the coast; Nasca line drawing in the desert, hand of the frog! The rally was all over now, the Mercedes is being delivered to the shippers today where it is being sent to Panama to do the Mayan Classic early next year. We then went off to the airport, back to UK, then straight off the next day to do the Thunder Dragon in India and Bhutan in the Porsche 912. It's hard work but someone's got to do it! Some pics of badly worn Mercedes tyres; George the rally doctor in the Merc after new tyres have been fitted; Lima evening rush hour traffic from hotel room, pollution and traffic is a big problem in Peru, it's rare to see the sky! And here I am doing a bit of Merc servicing to prepare her for the Mayan Classic. You can see even more photos and videos of this and other rallies on my Facebook page, please head over there and "Like" the page to follow other rallies that I take part in. And we're off for a second year aiming for a second win! The rally ran over four days in May and had an amazing field of veteran, vintage and pre-war machines and their equally competitive and combative drivers and navigators - oh what fun was in store for us over the next few says. The rally took us on a beautiful and evocative route through France and Spain to compete for the prestigious Charles Jarrott Trophy (more of that lower down!!). After a flying start the first day was cold and wet but the car ran well and Laurel did a good navigating job under enormous pressure. No results at the end of the day because in the awful weather conditions just finding our way was hard enough - being on time was an added bonus! 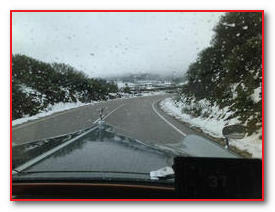 Coping with the adverse elements in an open car with no weather protection (apart from a sense of humour!) was 'interesting'. We did however have a rare break in the weather when we stopped for lunch and the sun broke through - someone up there took pity on us and let us relax a bit while we were taking on board sustenance. We were still leading the rally after two days as we moved into day three. The car is running well and Laurel is doing a great job navigating, not only having to cope with actually finding the route and the tricky timing but also having to contend with some more horrendous weather (again!). The car has no weather protection (thanks to Retrospeed Magazine for catching us at a dry point!) at all and at times today we were just swimming inside the car, bad for us and not good for the car either. The Italian name for a car like this is Barchetta which means little boat and it has been! Sadly there are no tests this year because of insurance limitations so rally is not as competitive as last year but at least the road book is working really well (last year there were a few problems which saw some cars going in every direction for the whole rally!) We retired that evening hoping that the storms would wear themselves out during the night and fingers crossed for some glorious Spanish sun to end the rally. Last day turned out to be pretty easy - if you went the right way which lots didn't! Laurel very pleased with herself (as she should have been) as we didn't take one wrong turning. And we did it again, winning in style for a second year running. The marvellous Charles Jarrott Trophy was presented to us and in my own shy and unassuming way I felt it was time to get a little excited about winning the trophy for a second year!! What do you think - style icon or slightly over exuberant? Moi? As always I wanted to finish first in class and overall but it wasn't to be! 24th Jan: Up to the second week the Rally had been pretty good and Burma was just great. Everything in Burma is good, roads, people, scenery, food and the weather. Mother is also fantastic coping with everything, she's so alert and interested, and still continuing with the great navigation! Other ralliests are suggesting that Mum should be in the Guinness book of records as the oldest rally navigator... now that's an idea! We stayed two nights in a hotel on Inle lake - it is just fantastic! Lovely hotel and lovely long boats that wisk you through wonderful scenes that are straight out of a Travel brochure. The Burmese people are just so nice and sweet it is almost too much. They have great reverence for age so treat Mother with great respect and tender care. It's so nice to be here and just loving everything about Burma. Here's Mum ready for the Guinness World Record for oldest rally navigator! 3rd Feb: Rally was still going really well and Mum was being just great and getting on famously with the rally and everyone involved. During this rally we were joined by Peter Hall, a Journalist from the Daily Telegraph, who wrote a weekly review column for the Telegraph website which you can check out by clicking here (see below for links to his full rally review). Peter is also producing a feature article for Saga magazine on Mum, I am told it is Britain's biggest circulation magazine, so looking forward to seeing that! The place was just lovely and we were in Bagan for three days, did a fantastic hot air balloon trip over the city which has huge Temples and thousands of smaller Stupas everywhere - just outstanding. 9th Feb: End of the road for the rally and we flew from Yangong to Bangkok and then on to Sydney to stay with my daughter Elizabeth and her family. The Road to Mandalay rally was one of the best. I'l take memories of Burma and the Burmese the roads, scenery and weather with me as we go. So nice to be with these people, they couldn't be nicer, such as shame to leave but we need to move on. The good news is that it inspired me to take a whole heap of photos, some appear on this page and the previous blog and you can see a lot more on my facbeook and twitter channels. A long rally but yet again Mum was fantastic, always alert and interested, never sleeping in the car, doing a superb job of navigation with the road book and generally people watching observing all and everything passing by and enjoying herself! We were taken by surprise by the fact there was some competition so had not taken any equipment for this but still tried to do it - though not very hard. We got some nice trophies for coming third in class. We stayed two days in Sydney then went off to New Zealand for three weeks. We'll be popping back to Oz for a while then back to UK on the 12th March. Need to get back by 29th March and ready as we are off to the Marrakech Express rally which takes place 29th March to 9th April. 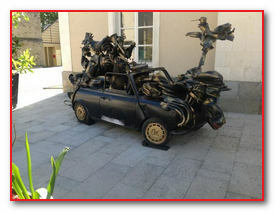 This is 15 2CV Citroen's starting in Spain then rushing about Morocco then back again. The route includes Meknes, Midelt, Merzouga, the Todra Gorge and the Atlas Mountains. Should be a great hoot as my friend Hayden Burvill, Porsche fanatic, owner of WEVO Porsche specialist parts company is coming from California to co-drive. He knows me well as we did the London to Capetown rally together. Watch this space for updates on the Marakesh rally! Can't get away from the Space Station elephant logo - as expected in Mandalay elephants are everywhere! "Great roads, great views, good competition. So very tired and very hot crew were very happy at the end! Car a bit battered but running well and sounding great." Not as high in the rankings as we wanted and are used to, but for the first real outing of the GTO it was a good test and we overcame some 'challenges'! At this stage there's not a lot more to add than that it was a great rally and thank you all for following and for your messages of support and of course at time the ribbing! We had some great times, some great weather (and some awful rain), got inventive with the air conditioning and cooling system and met a troublesome concrete post. The crew were marvelous and you can see below just how much the GTO inspired this bloodthirsty Swiss mechanic after cutting away our propshaft problem! My beloved Space Station sticker still hanging in there after all the heat and rain! That's it for the Pirelli Classic - but watch this space, I don't like coming in down the rankings so I feel another rally stirring and next time.... we'll be right up there! Keep following here and on my social media channels – updates coming when I can get time. I know that the UK weather isn’t a glowing summer at the moment but over here it is just so, so hot and at times humid. It’s been 3 days now on the Pirelli Marathon, we’ve had lots of dramas with the car but nothing that has stopped us – we wouldn’t let it! • The rally trip meter has given us lots of grief - first it wasn’t working at all then once we got it going again it failed to operate. • We have also had prop shaft problems but we’ve got those under control. But that’s meant for the last day we have had to impose a speed limit of exactly 62 MPH because at any speed over that the propshaft hits the floor hard! Rally is really good. We have been driving on great roads in France and now Switzerland, steaming hot for everybody but especially for us as the Ferrari is set up as the original 250 specification with very little heat or sound insulation so we are suffering with lots of both inside the car. Did I mention it was hot? Ferrari Air-Con modifications with extra slip streaming from Ferrari and Space Station logos. Everybody outside the car loves it, telling us how great it looks and sounds. This, after spending so much time, effort and, not to mention money, getting the car to its current state is really satisfying. We ended the first day at 9th overall and after three days we had moved up to 7th place. Not good by our standards - but a good result bearing in mind all the equipment failures. Stayed in a lovely setting on Lake Luzern having crossed over the lake by car ferry. Lovely day if just too HOT – did I mention it was too hot? Just back from Croatia and thought things were a bit quiet so we (once again joined by Catriona Rings my faithful navigator) started the Pirelli Classic Marathon 2013 on Saturday! Never a dull moment round here. This is another great rally and what better way to join and run it than in the glorious GTO. It took ages to build and convert this replica Ferrari 250 GTO from my original Ferrari 330GT with a proper V12 4 litre engine. So I've been chomping at the bit to get a Space Station Self Storage rallying sticker on the body and have a real run out with it. This will be the first time the GTO has been driven in anger so I'm really looking forward to seeing how it performs in its new guise. The rally started in Ypres, the Belgian capital of rallying with scrutineering on Saturday followed by the welcoming dinner in the evening. Then on Saturday morning we were off to Cortina d’Ampezzo via overnight stops in Luxembourg, Mulhouse, Engelberg and Bormio. The rally commemorates the 25th Anniversary of the original Classic Marathon in 1988. Then they had a target of driving across Europe to Cortina and all the way back again to the RAC Club in Pall Mall, London. This time though the rally ends in Cortina, no driving back just staying on to celebrate in Italian style. I'll be posting updates here and on my twitter and facebook pages, so if you don't follow me click on the links below and join me to read and see the latest news and gossip en route. Just back from the glorious London to Lisbon Rally, managed to achieve a Blue Riband and finish 4th in class and 13th overall out of a field of 50 so not a bad result after a few problems before and during the event! This was the 6th edition of this Rally and having competed before I was keen to do well and decided to take the Mercedes 280SL Sports with me after it served so well in India. But timescales were against me and word arrived that the Mercedes wouldn’t get back in time due to all manner of shipping controls, so I opted to take the Rolls Royce Silver Cloud llI which I used for the TransAmerica trip last year. Easy decision for me, but Joe had a lot of work to do to get it ready in time! After seven years, the epic London-Lisbon Reliability Trial and Tour 6th edition finally arrived. It's open to all cars up to end of 1983 and the 2,000-mile Classic Trial features ‘Tulip’ regularities, handling and manoeuvrability tests. Starting in the UK we were destined to travel through France and Spain arriving at the finishing line in Portugal 10 days later. The rally was long and eventful – but then what else would you expect from me! The route included some of the best scenery in England, France, Spain and Portugal. Here’s a rundown of the event and my ‘memorable moments. There’s more detail on my facebook page. For those of you that don’t already follow, might be an idea to follow now as there are more rallies coming, you can also see instant comments on my twitter channel so you can follow me there as well. I've just started a youtube channel as well so you can also see some 'interesting videos from the rally on there'! Laurel Smith, my co-driver, and I left Greenwich after being flagged off the starting line by João de Vallera, the Portuguese Ambassador to the UK, and were among 50 classic cars. The first day is always a challenge getting to grips with the route, trials and of course coaxing the Rolls along. We had a few problems with battery charging and some penalties on regularities and tests, but finished the day in a respectable 4th in class position and 23rd overall. 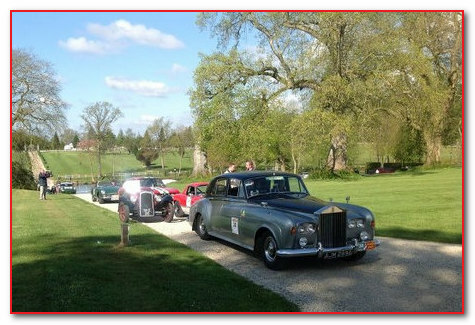 The car ferry was a sight to behold with 50 classic cars crammed nose to tail in rows – onlookers were abundant! The Rolls got a lot of admiring glances and a worthy mention in the press release from the organisers, Hero. We had a pretty uneventful day, made good progress and ended up two positions, 2nd in class and 16th in the field. Going well! We went to Nogaro circuit for some more tests. I think the last time I was there was with McLarens testing with Tambay for Monaco 72. Weather today was marvellous, cloudless sky and sunny and by the end of the day we had kept pace at 2nd position in class and increased our overall standing by 1 to 15th. We had split into two groups last night in different hotels and convened at a local classic car enthusiast’s garage as the starting point. The route to Pau was split into two session with lunch at the posh Château de Mirambeau with a code board section and unscheduled French roadworks (!) which extended the days timing. A few cars had retired over the few days and we started down to 42 crews in torrential rain – just like being at home in the UK! Our goal today was to pass into Spain and there were some fears that the rain might change into snow across the pass, but in the end unfounded and our way was clear – but wet! The test at Miranda Kart was great fun and saw us just drop to 3rd in class as we reviewed the days trials (and tribulations!) over dinner at the Hotel Palacio de la Merced and found out that another crew had pulled out due to clutch failure on their Mustang. Thought it was going to be a good viewing day, but early mist that gave way to sun was soon replaced by torrential rain – very challenging driving for the whole field. But managed to increase our position in class to 3rd and move two further up the field into 13th overall. In the evening we enjoyed some local tapas, a favourite of mine, and saw the splendid cathedral, a sight to behold, before retiring to the hotel for some well earned rest ready to start again in the morning as we head further across Spain with some more bad weather forecast. Today we saw the best of Spain spectacular scenery under clear blue skies and warming sunshine (a welcome change from the rain and snow we had experienced on the last few days). Two speed test tables today instead of the normal Jogularity style. Ending up at the Cabanas Kart circuit under the watchful eye of a local TV crew. Mirrors and make up to the ready as we got ready to complete the kart trial. After solid morning and afternoon events we ended the day at the same position, ready for a good meal and a well earned rest. Today saw us aiming to cross the border and a different challenge for the organisers today. The café next to the Spanish/Portuguese customs had shut down! So the planned coffee break after crossing into Portugal saw members of Hero fetching a generator to have coffee and cakes ready and waiting for us as if nothing was untoward. We had two kart circuits today and at lunch we thought we were in for some trouble as he local police arrived in numbers – only to discover that they were just car enthusiasts like everyone else. No trouble just genuine admiration. The rally remained on Spanish time even though we were crossing time zones – so that made it easier to manage throughout the day, moving up one place to 12th overall. We went to a race track today and were greeted by a photo of me and Cat in the Alfa taken at the first London to Lisbon rally. Talk about Déjà vu! Saturday and Sunday rolled into one as it was the roll into the finishing line. We did the Caramulo hill-climb which was supported by more police activity as they shut over 2.5km of public road so that we could run the event unhindered. Not sure we’d see this level of cooperation in every country! We two runs at the hill climb looping back after the first run to tee up for the second hill climb. Dinner was held at the Caramulo Museum across the road from tonight’s hotel. Hardly seems like yesterday that we left Greenwich, yet here we are ready for the final day of the rally. Today we had a real spot of bother as we came to a halt on the hill climb test completely. I had to get Laurel out and over to the Armco in case the next car hit us - they go at one minute intervals. We were there for more than a minute but eventually the car improved and we did the hill but with lots of penalties. The car seems to be able to tell when it's on a test - behaves fine then as soon as a test comes up it misbehaves! By the end of today we’ll have travelled 2,386 miles, across 4 countries and had 25 regularities and 14 tests. Hot today, 27 deg C. Lots of spectators as we approached the final stretches of the rally. The police were there again paving the way for us. We stopped in the historic square Praca do Comercio then late afternoon, flanked by police motorcycle outriders who stopped the traffic at all junctions and allowed us to go through all the red lights to the finish line. At the finishing line we were flagged across by Her Excellency Gill Gallard the British Ambassador to Portugal together with city councillor Mr Manuel Brito. A very prestigious finish. And, here we are, across the finishing line with the Rolls sporting my ever trusty Space Station windscreen sticker. We finished 4th in class and 13th overall with a Blue Riband. A great rally with some superb people. Good fun all round. Roll on the next one!